The task of curvature estimation from discrete sampling points along a curve is investigated. A novel curvature estimation algorithm based on performing line integrals over an adaptive data window is proposed. The use of line integrals makes the proposed approach inherently robust to noise. Furthermore, the accuracy of curvature estimation is significantly improved by using wild bootstrapping to adaptively adjusting the data window for line integral. Compared to existing approaches, this new method promises enhanced performance, in terms of both robustness and accuracy, as well as low computation cost. A number of numerical examples using synthetic noisy and noiseless data clearly demonstrated the advantages of this proposed method over state-of-the-art curvature estimation algorithms. Curvature is a widely used invariant feature in pattern classification and computer vision applications. Examples include contour matching, contour segmentation, image registration, feature detection, object recognition, and so forth. Since curvature is defined by a function of higher-order derivatives of a given curve, the numerically estimated curvature feature is susceptible to noise and quantization error. Previously, a number of approaches such as curve/surface fitting [1–5], derivative of tangent angle [6, 7], and tensor of curvature [8–11] have been proposed with moderate effectiveness. However, an accurate and robust curvature estimation method is still very much desired. Recently, the integral invariants [12–14] have begun to draw significant attention from the pattern recognition community due to their robustness to noise. These approaches have been shown as promising alternatives for extracting geometrical properties from discrete data. While curvature is just a special instance of invariant features under the rigid transformations (composition of rotations and translations), it is arguably the most widely used one in computer vision applications. In this paper, we propose a novel curvature estimator based on evaluating line integrals over a curve. Since our method does not require derivative evaluations, it is inherently robust with respect to sampling and quantization noise. In contrast to the previous efforts, we are interested here in the line integral. It should be noted that the strategy presented by Pottmann et al. can be trivially changed to compute curvature on curves. However, the resultant curvature estimate requires surface integrals taken over local neighborhoods. Compared with surface integral (also known as double integral), the line-integral formulation for curvature estimation has a reduced computational complexity in general. We will further discuss the complexity of numerical integration in Section 3. Our method is also a significant improvement over the previously reported work  in terms of estimation accuracy. This is because the earlier work evaluates integrals over a user-defined, fixed-size window surrounding the point where curvature is to be evaluated. Depending on the sharpness of the curvature, the window size may be too large or too small. An over-sized window would dilute the distinct curvature feature by incorporating irrelevant points on the curve into the integral. An under-sized window, on the other hand, would be less robust to noise and quantization errors. In this proposed curvature estimation algorithm, we evaluate line integrals over a window whose size is adaptively determined using the wild bootstrap procedure . As such, the size of the data window will be commensurate to the sharpness of the curvature to be estimated, and the resulting accuracy is expected to be significantly improved. The performance advantage of this proposed adaptive window curvature estimation algorithm has been examined analytically, and has been validated using several numerical experiments. The rest of this paper is organized as follows. Section 2 provides a brief review on the related work. In Section 3, the curvature estimation method based on line integrals is introduced. We subsequently formulate the problem of choosing an optimal window size and derive an adaptive curvature estimator in Section 4. In Section 5, we provide experimental results to show the robustness and accuracy of the proposed method. Comparisons with existing curvature estimation methods are also included. Finally, we make concluding remarks and discuss future works in Section 6. Due to the needs of many practical applications, extensive research has been conducted on the problem of curvature estimation. In a real-world application, data are often given in discrete values sampled from an object. Hence, one is required to estimate curvature or principal curvatures from discrete values. Flynn and Jain  report an empirical study on five curvature estimation methods available at that time. 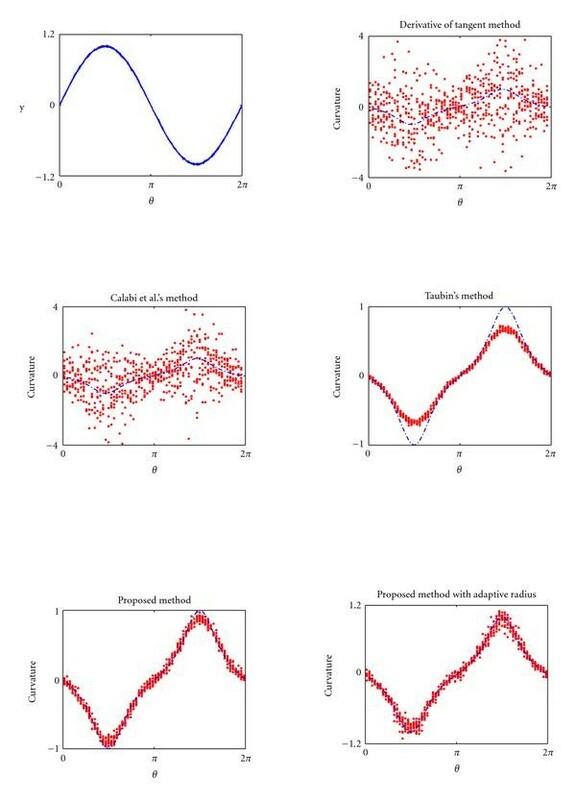 Their study's main conclusion is that the estimated curvatures are extremely sensitive to quantization noise and multiple smoothings are required to get stable estimates. Trucco and Fisher  have similar conclusion. Worring and Smeulders  identify five essentially different methods for measuring curvature on digital curves. By performing a theoretical analysis, they conclude that none of these methods is robust and applicable for all curve types. Magid et al. provide a comparison of four different approaches for curvature estimation on triangular meshes. Their work manifests the best algorithm suited for estimating Gaussian and mean curvatures. 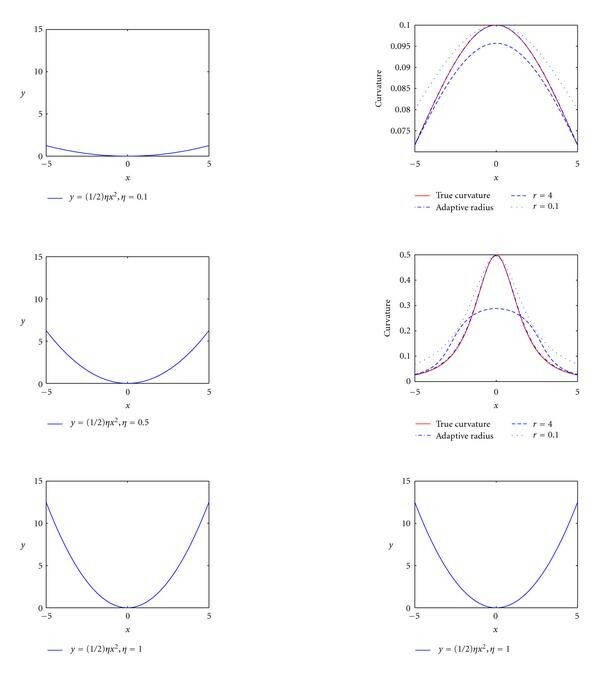 In the following sections, we will discuss different kinds of curvature estimation methods known in the literature. Also, we will review some related work in integral invariants and adaptive window selection. The approaches based on the derivative of tangent can be found in [6, 18–20]. Given a point on a curve, the orientation of its tangent vector is first estimated and then curvature is calculated by Gaussian differential filtering. This kind of methods are preferable when computational efficiency is of primary concern. The problem associated with these approaches is that estimating tangent vector is highly noise-sensitive and thus the estimated curvature is unstable in real world applications. The definition of osculating circle leads to algorithms which fit a circular arc to discrete points [2, 3, 21]. The curvature is estimated by computing the reciprocal of the radius of an osculating circle. An experimental evaluation of this approach is presented in the classical paper by Worring and Smeulders . The results reveal that reliable estimates can only be expected from arcs which are relatively large and of constant radius. As the acquisition and use of 3D data become more widespread, a number of methods have been proposed for estimating principal curvatures on a surface. Principal curvatures provide unique view-point invariant shape descriptors. One way to estimate principal curvatures is to perform surface fitting. A local fitting function is constructed and then curvature can be calculated analytically from the fitting function. The popular fitting methods include paraboloid fitting [22–24] and quadratic fitting [1, 25–27]. Apart from these fitting techniques, other methods have been proposed, such as higher-order fitting [5, 28] and circular fitting [29, 30].Cazals and Pouget perform a polynomial fitting and show that the estimated curvatures converge to the true ones in the case of a general smooth surface. A comparison of local surface geometry estimation methods can be found in . The paper written by Flynn and Jain  reports an empirical evaluation on three commonly used fitting techniques. They conclude that reliable results cannot be obtained in the presence of noise and quantization error. The tensor of curvature has lately attracted some attention [8–11, 32]. It has been shown as a promising alternative for estimating principal curvatures and directions. This approach is first introduced by Taubin , followed by the algorithms which attempt to improve accuracy by tensor voting [9–11, 32]. Page et al. present a voting method called normal voting for robust curvature estimation, which is similar to [10, 32]. Recently,Tong and Tang propose a three-pass tensor voting algorithm with improved robustness and accuracy. Recently, there is a trend on so-called integral invariants which reduce the noise-induced fluctuations by performing integrations [12, 13]. Such integral invariants possess many desirable properties for practical applications, such as locality (which preserves local variations of a shape), inherent robustness to noise (due to integration), and allowing multiresolution analysis (by specifying the interval of integration). In , the authors present an integration-based technique for computing principal curvatures and directions from a discrete surface. The proposed method is largely inspired by both Manay et al. and Pottmann et al. , in which they use a convolution approach to calculate an integral. 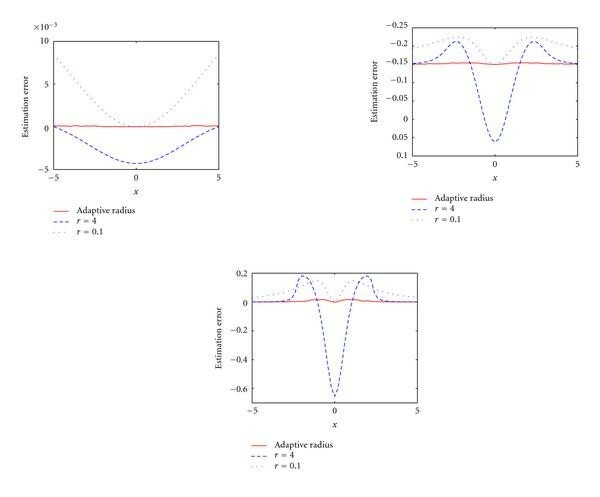 In this paper, we investigate avoiding the convolution with polynomial complexity by instead using the one with constant complexity. The curvature estimation algorithms mentioned above have the shortcoming of using a fixed window size. On one hand, if a large window is selected, some fine details on a shape will be smoothed out. On the other hand, if a small window is utilized, the effect of discretization and noise will be salient and the resultant estimate will have a large variance. To mitigate this fundamental difficulty in curvature estimation, a window size must be determined adaptively depending on local characteristics. A number of publications concerning the issue of adaptive window selection have appeared in the last two decades [33–37]. In the dominant point detection algorithms [33, 35, 36], it is important to select a proper window for estimating curvature. Teh and Chin  use the ratio of perpendicular distance and the chord length to determine the size of a window.B. K. Ray and K. S. Ray introduce a new measurement, namely, -cosine, to decide a window adaptively based on some local properties of a curve. Wu  proposes a simple measurement which utilizes an adaptive bending value to select the optimal window. Recently, the bootstrap methods  have been applied with great success to a variety of adaptive window selection problems. Foster and Zychaluk  present an algorithm for estimating biological transducer functions. They utilize a local fitting with bootstrap window selection to overcome the problems associated with traditional polynomial regression. Inspired by their work, we develop an adaptive curvature estimation algorithm based on the wild bootstrap method [15, 39]. We will elaborate the associated window selection algorithm in Section 4. In this section, we introduce the approach for estimating curvature along a planar curve by using line integrals. First, we briefly review some important results in differential geometry. Interested readers may refer to  for more details. Let be an interval and be a curve parameterized by arc length . To proceed with local analysis, it is necessary to add the assumption that the derivative always exists. We interpret as the trajectory of a particle moving in a 2-dimensional space. The moving plane determined by the unit tangent and normal vectors, and , is called the osculating plane at . where denotes the upper half of , that is, . In (3), we first perform line integral on the upper half of (the first term) and then subtract the line integrals on the portions of that are between and -axis (the second and third terms). We utilize two straight lines to approximate the portions of bounded by and -axis. (a) For a point (the black square dot) on a curve (the gray line), we draw a circle centered at that point. The integral region is denoted by red dashed line. It is convenient to write the equation of the curve, in the neighborhood of , using and as a coordinate frame. (b) After obtaining and , the line integrals can be easily computed. It does not matter which coordinate system we use for computing and . One can always obtain a curvature estimate by performing eigenvalue decomposition. So, curvature can be estimated by performing the principal component analysis on the region . In a real-world application, it does not matter which coordinate system is used for computing a covariance matrix. One can conduct the eigenvalue decomposition of and then obtain a curvature estimate. The procedure for curvature estimation is as follows. Let be a point on a curve. We draw a circle with radius centered at . The intersections of the circle and the curve are denoted by and . The angle between the vector and the -axis is denoted by . Similarly, denotes the angle between the vector and the -axis. An example is shown in Figure 1(b). where contains the eigenvalues of and contains the corresponding eigenvectors. Because is real and symmetric, the eigenvectors and are orthogonal. Generally speaking, (10) shows the Singular Value Decomposition (SVD) and thus the diagonal elements of are also called the singular values of . The unit tangent at , denoted by , must be parallel to either or . If the eigenvector parallel to were identified, one could compute curvature by using the corresponding eigenvalue (see (7)). Here, we choose the eigenvalue by comparing signs of inner products and . If were parallel to , the signs of and must be different. One can use either or . Pseudocode for computing curvature utilizing is shown below. Note that the numerical integration is typically computed by convolution in the previous work [13, 14]. For example, when evaluating the area integral invariant  of a particular point on a curve, the standard convolution algorithm has a quadratic computational complexity. With the help of the convolution theorem and the Fast Fourier Transform (FFT), the complexity of convolution can be significantly reduced . However, the running time required by the FFT is , where equals the number of sampling points in an integral region. Compared with the earlier methods [13, 14], the complexities of the integrals in (8) are constant and hence our method is computationally more efficient. A critical issue in curvature estimation by line integrals lies in selecting an appropriate circle. The circle must be large enough to include enough data points for reliable estimation, but small enough to avoid the effect of oversmoothing. For this reason, the radius of a circle must be selected adaptively, based on local shapes of a curve. In this section, we will first formulate the problem of selecting an optimal radius and then present an adaptive radius selection algorithm. where is the expectation (the value that could be obtained if the distribution of were available). However, the minimizer of cannot be found in practice since it involves an unknown value . where the asterisks denote that the statistics are obtained from bootstrap samples. The conceptual block diagram of the radius selection algorithm using bootstrap method is shown in Figure 2 and the detailed steps are described below. Given a point on a curve, we draw an initial circle of radius . By using the estimator described in Section 3, the estimate is calculated from the neighboring points of within radius . In the rest of this paper, we will use to denote the neighboring points of within radius . where is called a modeling error or residual. Note that we use the moving plane described in Section 3 as our local coordinate system. where the 's are independent standard normal random variables. We use to denote a wild bootstrap dataset. By repeating the third to the fifth steps, we can generate many wild bootstrap datasets, that is, . 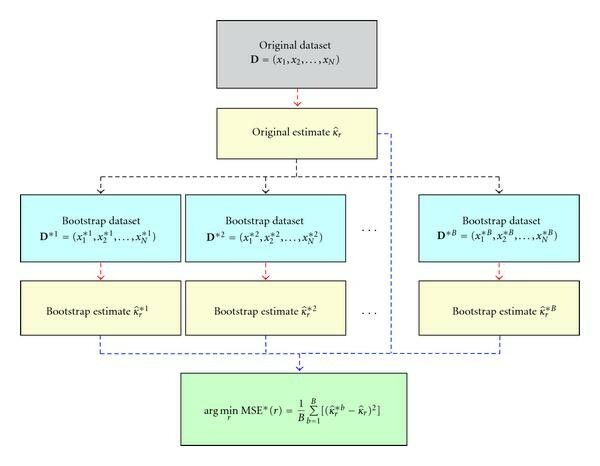 The larger the number of wild bootstrap datasets, the more satisfactory the estimate of a statistic will be. Block diagram of the radius selection algorithm using bootstrap method. We conduct several experiments to evaluate the performance of the proposed adaptive curvature estimator. In Section 5.1, we demonstrate how the radius of the estimator changes with respect to local contour geometry. In Section 5.2, the experiments are conducted to verify whether the adaptivity provides an improved estimation accuracy. And, the robustness of the proposed method is experimentally validated in Section 5.3. These experiments are intended to qualitatively verify the behavior of selecting an optimal radius. The curves are utilized as test subjects in the experiments. The sampling points along a curve are generated by performing sampling uniformly along the -axis. The radius of the proposed adaptive curvature estimator ranges from to with the step size of . Figure 3 shows the adaptively varying radii obtained by our method. We can see that the radius is relatively small near the point at and become larger as is increasing. This phenomenon corresponds to our expectation that a smaller radius should be chosen at a point with high curvature so that smoothing effect can be reduced. In a low-curvature area, a larger radius should be selected so that a more reliable estimate can be obtained. Since the behavior is in accordance with the favorable expectation, the remaining issue is whether the adaptively selected radius indeed improves estimation accuracy. In the following section, we will perform an experimental validation on this issue. The proposed adaptive curvature estimator is applied to the curves depicted in (a), (c), and (e). The resultant radii of are shown in (b), (d), and (f), respectively. In the quantitative analysis, the curvature estimate obtained by adaptive radius is compared against the true curvature, and the estimate obtained by fixed radii. In Figure 4, it can be seen that the curvature estimator with a fixed undersize radius will be accurate at the peak but inaccurate in the flat regions. On the other hand, the curvature estimator with a fixed oversize radius will lead to over smoothing and hence be inaccurate at the peak. Therefore, it is desirable that the curvature estimator could adapt according to the input data. By adjusting the radius adaptively, we observe that the precision of curvature estimation is significantly improved. Figure 5 depicts the estimation errors of using fixed radii and adaptive radius. It is obvious that the estimation errors of the adaptive radius algorithm are much smaller than those of the fixed radius algorithm. In short, we have demonstrated that the estimation accuracy depends largely on the radius of and it can be significantly improved by using adaptive radius. True curvatures and estimated curvatures of the curves in (a), (c), and (e) are shown in (b), (d), and (f), respectively. The curvature estimates are obtained by an adaptive radius and fixed radii. The estimation errors in Figures 4(b), 4(d), and 4(f) are shown in (a), (b), and (c), respectively. In Section 3, the concept of curvature estimation via line integrals has been developed under an error-free assumption. However, in practical applications, perturbations in the input data can arise from many sources, such as roundoff errors or sensor noise. In this section, we will evaluate the robustness of the proposed curvature estimator and will compare it with existing approaches. Before dealing with noisy data, we first consider noise-free cases. Two curves are utilized in our experiments. One is a sinusoidal curve which contains both positive and negative curvatures (see Figure 6(a)). The other one is a closed curve given by (see Figure 8(a)). These continuous curves have been discretized by uniformly sampling in the angular variable and curvature is estimated at each sampling point. 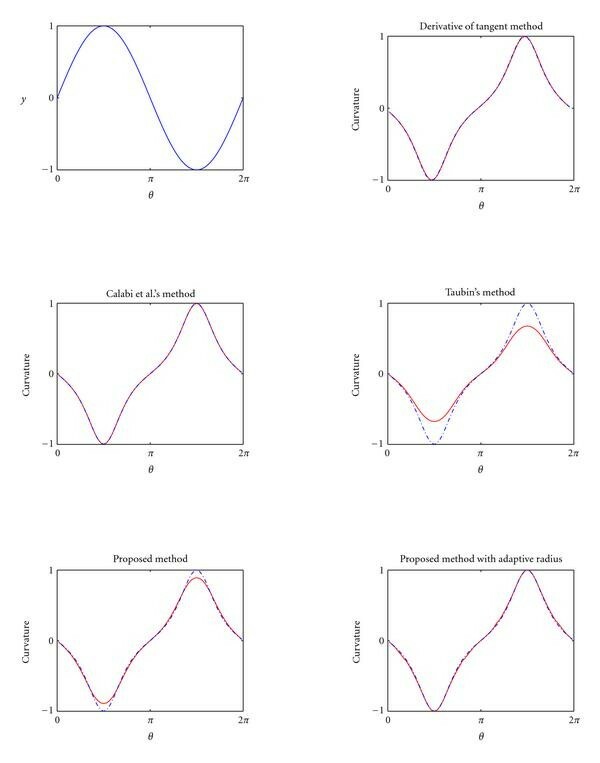 (a) A sinusoidal waveform, (b) curvature estimate obtained by derivative of tangent, (c) curvature estimate obtained by Calabi et al. 's algorithm, (d) curvature estimate obtained by Taubin's algorithm, (e) curvature estimate obtained by line integrals, and (f) curvature estimate obtained by line integrals with adaptive radius. Notice that a dashed blue line denotes the true curvature. 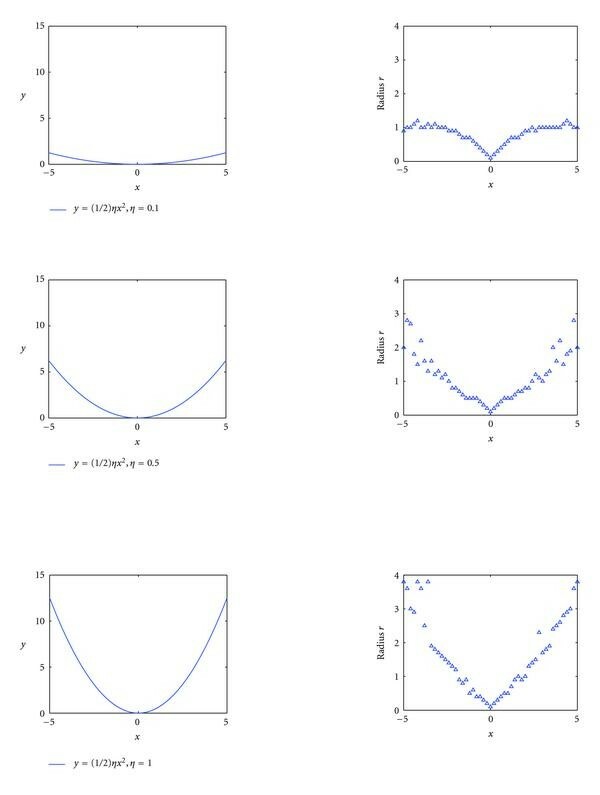 Figures 6(b) and 8(b) give the curvature estimate obtained by the derivative of tangent . The results obtained by Calabi et al. 's method  are shown in Figures 6(c) and 8(c). Both of these methods calculate a curvature estimate from three successive sampling points and thus can yield an excellent accuracy under a noise-free condition. However, this kind of approach cannot have reliable results under practical situations where perturbations are inevitable. By using another integral-based method , the curvature estimates calculated from the noisy shapes are shown in Figures 7(d) and 9(d). Similar to the proposed method with a fixed radius, this method can obtain reliable results from noisy data but has large estimation errors in high curvature regions. Trial-to-trial variability in curvature estimates. The data consist of 10 trials. 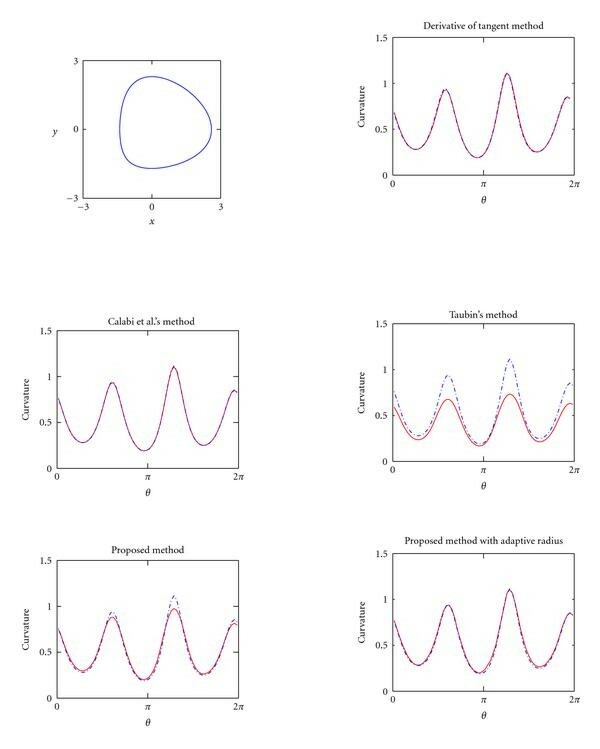 (a) sinusoidal waveforms with additive Gaussian noise, (b) curvature estimate obtained by derivative of tangent, (c) curvature estimate obtained by Calabi et al. 's algorithm, (d) curvature estimate obtained by Taubin's algorithm, (e) curvature estimate obtained by line integrals, and (f) curvature estimate obtained by line integrals with adaptive radius. Notice that these figures have different ranges in vertical coordinate because some methods yield noisy results. The true curvature is denoted by a dashed blue line. (a) The closed curve , (b) curvature estimate obtained by derivative of tangent, (c) curvature estimate obtained by Calabi et al. 's algorithm, (d) curvature estimate obtained by Taubin's algorithm, (e) curvature estimate obtained by line integrals, and (f) curvature estimate obtained by line integrals with adaptive radius. Notice that a dashed blue line denotes the true curvature. Trial-to-trial variability in curvature estimates. The data consist of 10 trials. 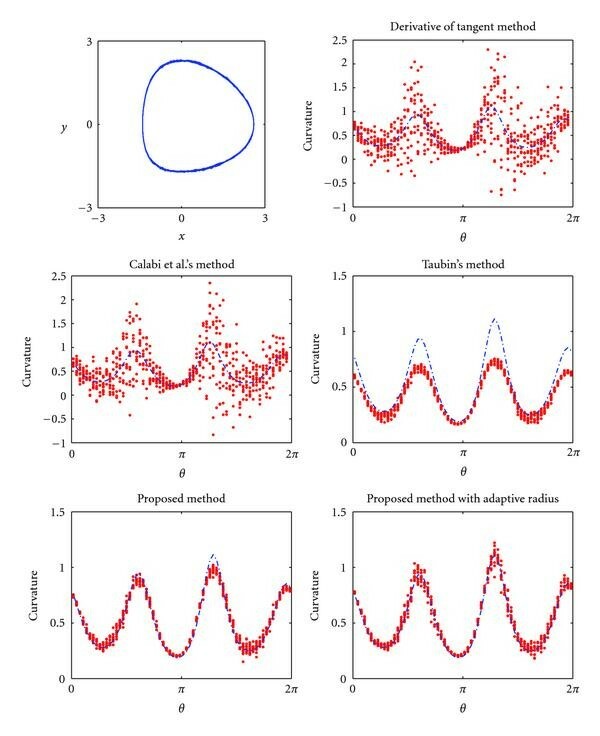 (a) The closed curves with additive Gaussian noise, (b) curvature estimate obtained by derivative of tangent, (c) curvature estimate obtained by Calabi et al. 's algorithm, (d) curvature estimate obtained by Taubin's algorithm, (e) curvature estimate obtained by line integrals, and (f) curvature estimate obtained by line integrals with adaptive radius. Notice that these figures have different ranges in vertical coordinate because some methods yield noisy results. The true curvature is denoted by a dashed blue line. Compared with the above mentioned methods, the proposed curvature estimator with a fixed radius has larger estimation errors, especially in sharp regions (Figures 6(e) and 8(e)). This is an expected result because the circle provides a smoothing effect on sharp corners. As one can see in Figures 6(f) and 8(f), the estimation accuracy is significantly improved once the radius of at each point is adaptively determined. In the following experiments, we add noise to the original shapes and then perform curvature estimation on the noisy shapes. Figure 7 depicts the results of trials. It is obvious that the proposed method, with or without adaptive radius, is able to obtain reasonable estimates while the derivative of tangent  and Calabi et al. 's algorithm  have significantly larger trial-to-trial variabilities. The same phenomenon is also observed in Figure 9. The results strongly suggest that sensitivity to perturbations is significantly reduced by using the proposed method. The proposed approach for curvature estimation is clearly a better choice if the input data are likely to be noisy. A novel curvature estimator, which achieves robustness to noise without sacrificing estimation accuracy, is presented in this paper. The novelty of the proposed method lies in performing line integrals on a circle. Because of performing integrations, we can avoid numerical differentiation which is a notoriously unstable process. Furthermore, instead of choosing a fixed radius for the circle, an optimal radius is determined at each point to minimize estimation error. We present extensive simulation results that demonstrate the effectiveness of our approach as compared with the recently proposed approaches [7, 8, 41]. Notice that we choose  for comparison because it is frequently used as a baseline algorithm in the literature. Although the estimator introduced by Taubin  is aiming for principal curvatures on surfaces, it can be trivially changed to compute curvature on curves. An important issue for future research is to generalize the proposed framework to the estimation of principal curvature. To position our approach among others, we would also like to conduct a comparative study of more curvature estimation methods. The authors have been partially supported by the National Science Council, Taiwan (Grant no. 98-2221-E-194-039-MY3).